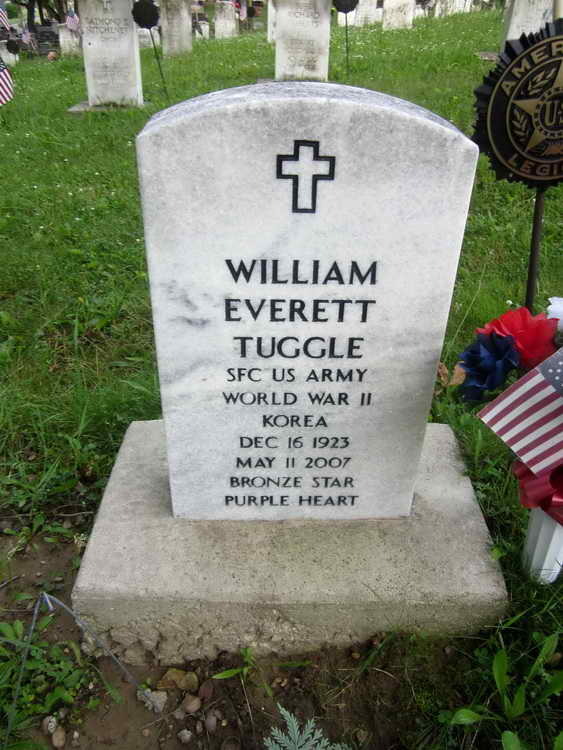 William Everett Tuggle, 83, New Castle and formerly of Kokomo, was a warrior who fought his last battle and entered Heaven's gates with a triumphant shout of victory. He went home Friday morning, May 11, 2007, from New Castle. He operated Tuggle's Super 98 service station and wrecker service in Kokomo as well as the Drop Zone Restaurant. Survivors include his wife, Juaneta; a daughter, Lorene Tuggle Allen, Tacoma, Wash.; two sons, William Jr. and fiance Annie Wise, both of Greensburg, and Loren and wife Judith, Indianapolis; two stepsons, Dale and wife Jeannie Fox, and Delbert Jeffrey Fox, all of New Castle; a granddaughter, Amber Renee and husband Pat Comp, Norfolk, Va.; a step-granddaughter, Cassie Perdew, Indianapolis; three stepgrandsons, Josh, Travis and Sam Fox, all of New Castle; two great-grandchildren, Brandon and McKinsey Comp, both of Norfolk, Va.; two sisters, Ethel Jones and Marge York, both of New Castle; a sister-in-law, Nell Tuggle, Monticello, Ky.; and several nieces and nephews. He was preceded in death by his first wife and mother of his children, Audrey Tuggle; a sister, Nadine; and a brother, Wayland. Services are 10 a.m. Tuesday at South Side Church of the Nazarene, with the Revs. Michael Dees and David Perry officiating. Burial will follow in South Mound Cemetery. Friends may call from 2 to 5 p.m. and 7 to 9 p.m. today at Hinsey-Brown Funeral Service in New Castle and one hour prior at the church. Military rites will be conducted by the American Legion and the VFW. Grave marker for William E. Tuggle in South Mound Cemetery, New Castle (Henry county), Indiana. William enlisted in the Army at Louisville, KY. He apparently transferred to the 508th PIR sometime in late 1945. 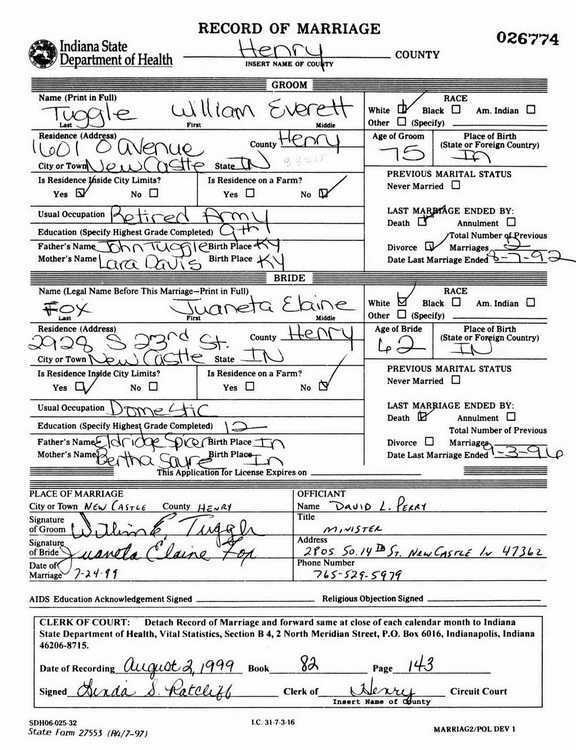 As shown on his marriage certificate, he retired from the Army. His grave marker carries the rank of SFC with service during WWII and Korea. Also shown is that he had received the Bronze Star medal and Purple Heart.